After a drought-busting winter at the end of last year firefighters are predicting a bad fire season due to the increase of brush growth that blanked the mountains and foothills. This combined with the lack of heavy rain in recent month’s means dry hills that are waiting for a small spark to ignite. This is leaving California residents wondering: How do I keep my home safe? 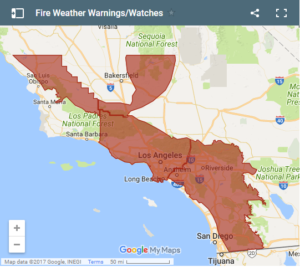 The area surrounding your home is going to be the key factor when a wildfire is burning through. Clearing combustible debris from around the house such as dry grass, brush, and firewood will go a long way. In addition, if you have a wooden fence or deck that expand into brush consider clearing them, giving them a larger clearance space, or replacing them with more fire resistant materials. Defensible space is the key term. This means clearing out at least 30 feet from your home with concentric rings of fuel reduction set further out. The clearer the area around your room the higher chance there is for a fire crew to be able to protect it. After you’ve done your prep work it is important to stay vigilant. 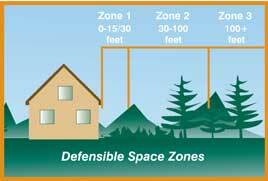 Ensure that your preparation stays current and that your defensible space is clear. Additionally, keep your home maintained. This means clearing your gutters of fallen leaves and evaluate your roofing materials. Remember, upkeep of these areas could prevent that fatal spark from igniting onto your home. Despite your best efforts it’s possible that the wildfire is simply too difficult for our brave firefighters to contain. This means evacuating when given the order. However, defense doesn’t stop here. With specialized homeowner insurance policies such as Northlight you can opt-in to receive Phos-Chek home defense at no additional cost. This defense system has a specialized team spray your home with a fire retardant that is the same product used by the United States Fire Service in their air tankers. Even leaving your home behind you can know that you have done everything possible to keep your possessions safe. ← Do you know what insurance Gaps you’re facing if a brush fire hits your home?